Tess- this is a lovely image. Thank you so much. 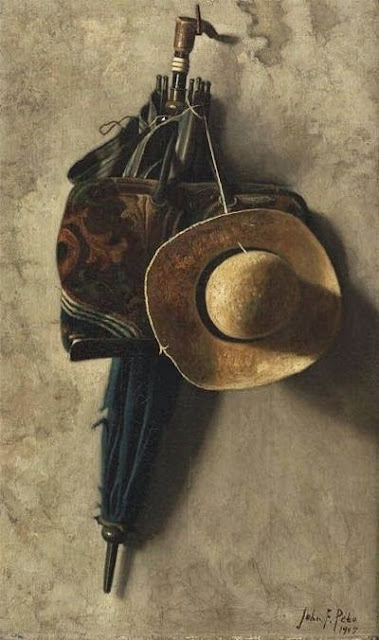 It’s not me who is in despair...but the owner of the hat and umbrella! I expect a lot of sad poems on this one.. but hey I like melancholy. It was a good prompt for this time of month I enjoyed it thank you! My blog is unlinked from Google+ now and you shouldn't have to share my work now. I hope it makes it easier on everyone. Have a good Memorial Day weekend all! Hugs! Lovely Lovely Prompt.. I wrote what I could first think..hope you all will like it. Trying to get back in the flow of things. I'm moving my blog website, so this week's prompt was perfect for me! Thanks, Tess! I could have used this hat and umbrella nearly all weekend! Good prompt. Back from a weekend "away from it all." This reminded me of a certain London nanny, Tess. Off to read some of the other entries now. Nice one. I posted a wrong link number 38. How can I remove it? Also, how can i get prompts on my email to write on them regularly?